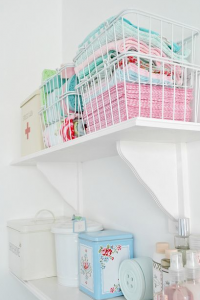 10 Top Tips for Organizing Your Laundry Room! 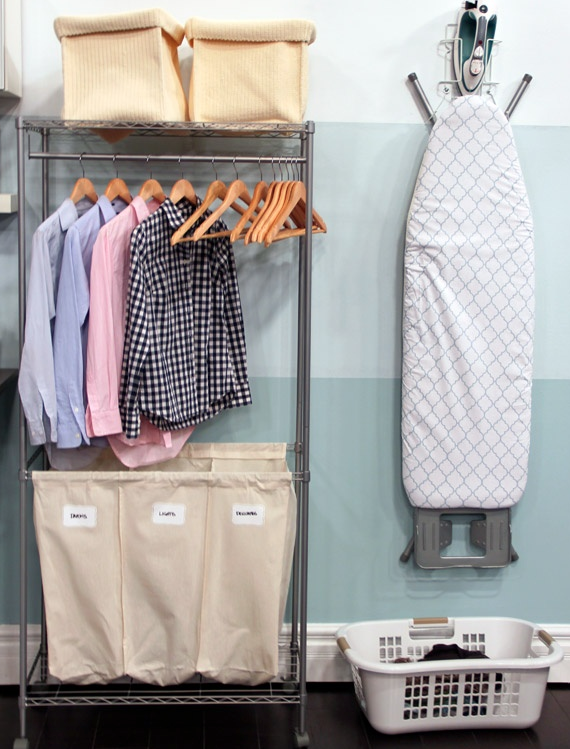 Your laundry room should be more than a dumping ground for dirty clothes and a place to store your vacuum cleaner. With good design, proper organization and some pretty paint, this utility space can be transformed to a pleasant place to spend some time! OK…unless you love doing laundry this is probably an exaggeration, but these things sure can help make laundry less onerous! 1. 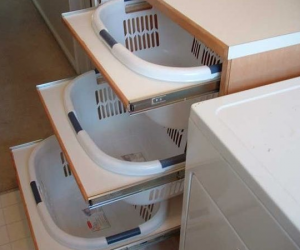 Convert a cupboard to pull-out baskets. 2. 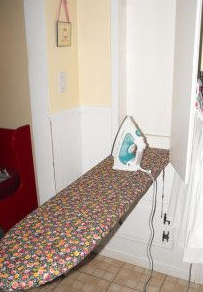 Have a built-in ironing board! Ironing boards always seem to be in the way. The joy of a built-in version is being able to fold it up and get it out of the way when you don’t need it. 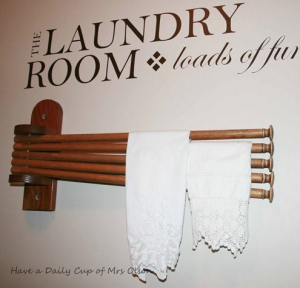 Maybe even have a cubby below to store your iron and linen water…Ooooh! And if you can’t build it in then at least put up a few hooks to hang the ironing board out of the way. You can even add some painted wood and trim to make it a décor feature! Again, this makes smart use of your space and can be pulled out when needed and pushed back when empty. Hang all of your ‘unmentionables’ on it and spare your delicates the heat and damage of the dryer. There are many types available. This accordion version offers many rods in a compact design. Why not make use of every space? 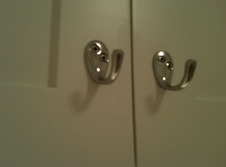 These simple, yet functional pieces of hardware can come in handy when you have loads of laundry to do. 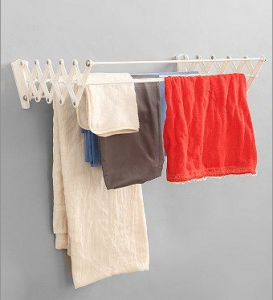 Save energy and money by letting things hang to dry. 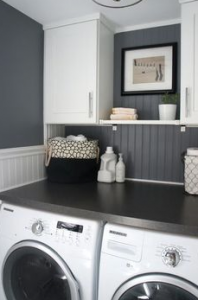 This is an easy way to add function and style to your laundry room. Use some pretty containers to store dryer sheets, linen water and even some pretty ‘objets d’art’. You can even add some decorative baskets to store other household items like light bulbs, cleaning supplies and tablecloths. I also recommend a clock so you don’t get lost in the beauty of your stunning laundry room and forget to do your other chores! 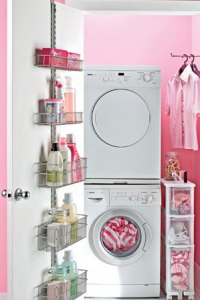 Here is another opportunity to add pretty things to your laundry room. 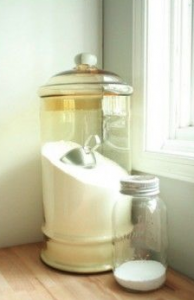 Use a collection of antique glass containers that your grandmother gave you or a funky modern plastic set that you found at Walmart to hold your laundry detergent, washing soda or dryer sheets. Keep your overstock on those handy shelves that you put up. Use your creativity here! Make space for the loose change and other surprises that you find in pockets (or the dryer…). 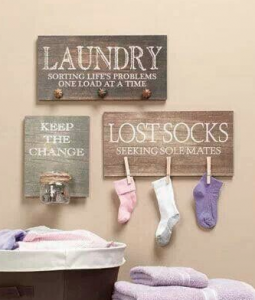 Since every laundry room has a black hole that socks disappear into, then you will need a place to hang the orphans until they can be reunited (is that possible?). In my case, I use a small basket since I currently have about 35 socks without mates in my house! What the..? 8. Paint the room a happy colour! What colour make you feel happy? Pink? Sea glass blue? Meadow green? 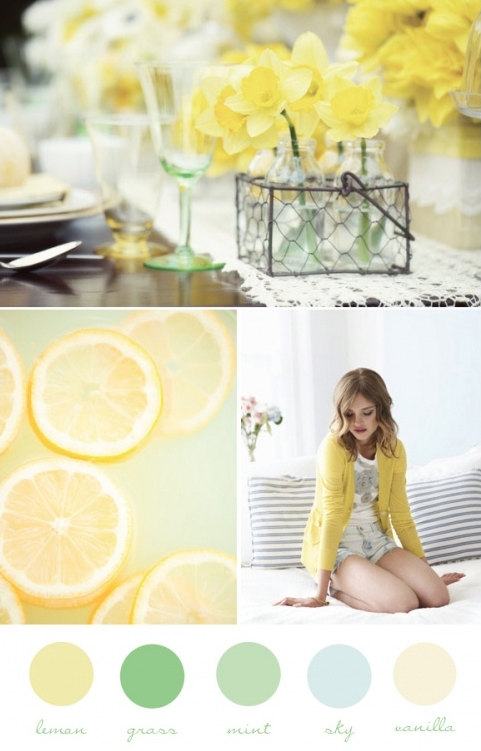 Paint an accent wall or do the whole room that colour. Accent it with bright white to create a clean, fresh look. You will be more likely to spend time in there and get your laundry done! 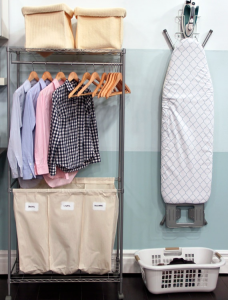 Add hooks, racks or even a good shower caddy on to the door to create extra storage. 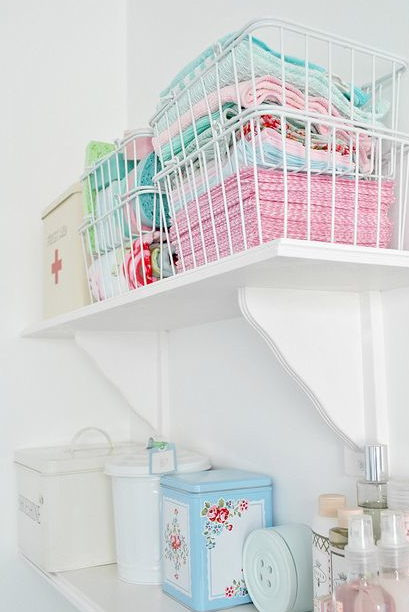 This is especially handy for small laundry rooms where you can’t add shelving or cupboards. 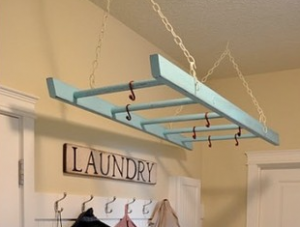 Using strong hooks, suspend an old ladder from the ceiling (it only needs to be and inch or two lower) so you can hang laundry to dry. 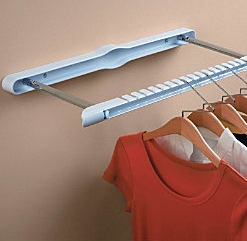 Buy some good quality hangers and clothespin hooks so you can dry blouses, lacy undies, and other handwash items. 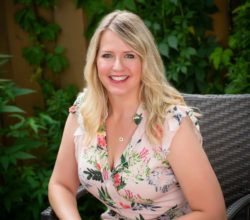 Professional Organizer: What do they really do? 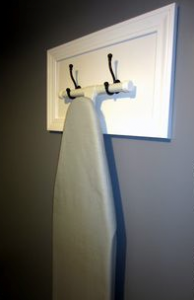 Love the idea to replace your door knobs with hooks, your fun signs and ladder for hanging delicates. Great imagination! Thanks for you comment! I now look at junk shops in a whole different light. So many little trinkets could be great organizing tools!